Known for exceptional quality and outstanding results, Merz is a specialty healthcare company providing a portfolio of innovative products and services throughout the United States. Nosco’s Solutions Engineering and Invention Engine teams recently partnered with global aesthetics company, Merz, to engineer a presentation-style solution for their family of injectable dermal fillers, RADIESSE® and RADIESSE® (+) Lidocaine. These injectable dermal fillers were previously presented in a top-tuck carton, requiring the administrator to open and tip the carton to remove the components, which did not make for a high-end presentation for clientele. 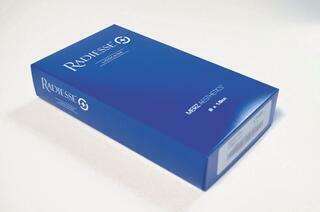 During initial research and development, it was determined that the final packaging needed to accommodate two flexible pouches containing the RADIESSE® or RADIESSE® (+) Lidocaine product, and their accompanying needles. 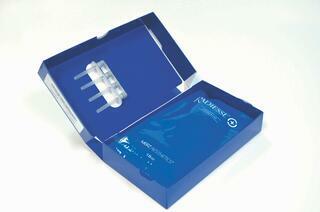 Additionally, the packaging needed to have presentation element for handling during consults and procedures. To accompany the packaging design, Nosco worked closely with Merz to create product information label structures to reduce labeling on the pouch and improve the overall aesthetic. The structural features of this packaging include a durable, double wall design, lid locks and inner carton flaps to suspend needles and aid in fulfillment. Nosco also implemented several decorative features for a premium look and a lasting first impression, including a scuff-resistant coating, inner-carton printing, embossed lettering and a bold color block design for a memorable brand experience. The presentation-style, open-book design offers a convenient display of product with a unique approach to a common kitting challenge. The package presents syringes and needles in a neat, organized fashion (old package required an “open and dump” approach to remove all components). The carton can be reclosed with a built-in snap close feature, allowing it to be stored and used for additional procedures / presentations by the administrator. Its clean design, paired with a high-scuff resistant coating allows for printing deep, rich colors that will not damage during the conversion process. This promotes a positive brand experience and allows it stand out from other cluttered competitor packages on the market. Merz Aesthetics and the Merz Aesthetics logo are registered trademarks of Merz Pharma GmbH & Co. KGaA. Nosco recently teamed up with Merz North America to enter the 2017 North American Paperboard Packaging Competition. Through this joint effort, Merz North America and Nosco were recognized with a general excellence award for the specialty folding carton mentioned above. This prestigious competition is judged by a jury of various packaging professionals, experts and professors. It is regarded as the premier competition for packaging concept, design, print, performance and shelf appeal.